Fortune’s smokehouse and shop is one of Whitby’s most famous attractions and they can both be found on the pretty and historic east-side of Whitby, North Yorkshire. The smokehouse nestles beneath the ancient cliffs, under the gaze of St. Mary’s Church, and is located towards the end of a narrow cobbled street known as Henrietta Street, beyond the famous 199 steps which lead up to Whitby Abbey. As you walk towards the smokehouse the all-pervasive aroma of wafting oak wood smoke fills the air and your nose will lead you towards what surely must be one of the best places in Britain to buy kippers! The distinctive aroma will whet your appetite long before you even arrive at the smokehouse. 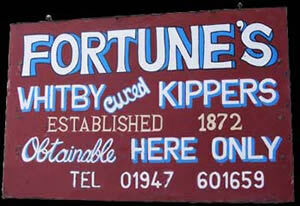 Fortune’s kippers are the only genuine and authentic Whitby kippers because the Fortune family own and run the only traditional smokehouse in Whitby. To peep inside the famous Fortune’s smokehouse is to awaken your senses to the flavours, tastes and smells of long ago!